One casting is available only as part of a full collection. This sculpture, created in 1985, was approved and signed by Casey Tibbs before casting in bronze…Mounted on a marble and walnut base. Rodeo legend and superstar of the 1940s thru the 60s, Casey Tibbs, on Buetler Bros. famous bronc, Necktie. 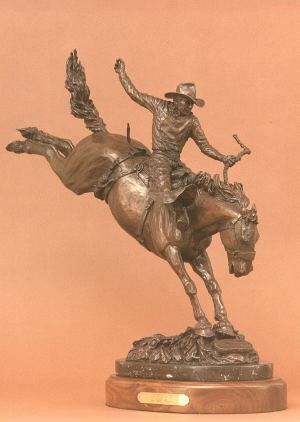 In 1989 this bronze was enlarged to monumental size as “The Champ” and now graces the entrance to The ProRodeo Hall of Fame in Colorado Springs, Colorado.